The CHATILLON® LTCM100 Series is an economical, motorized tester optimized for product floor operation. 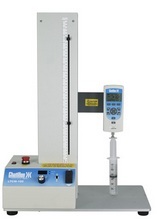 When combined with a Chatillon DF Series digital force gauge, it provides users with an easy-to-use testing system for tensile, compression, peel and flexural testing applications. The LTCM100 Series can also use the digital output of a Chatillon DF Series digital force gauge to stop crosshead travel when a load limit is achieved. The LTCM100 Series is supplied with a hook and compression plate and certificate of conformance.